All the neighbours up on Ravenwood/Wildlark in the west end are talking about the damage a driver did on their street last night. According to the police report, an erratic driver behind the wheel of a truck at around 9:30 p.m. damaged up to 20 lawns, struck 2 vehicles, a light pole, and 2 utility poles. He also knocked down trees. 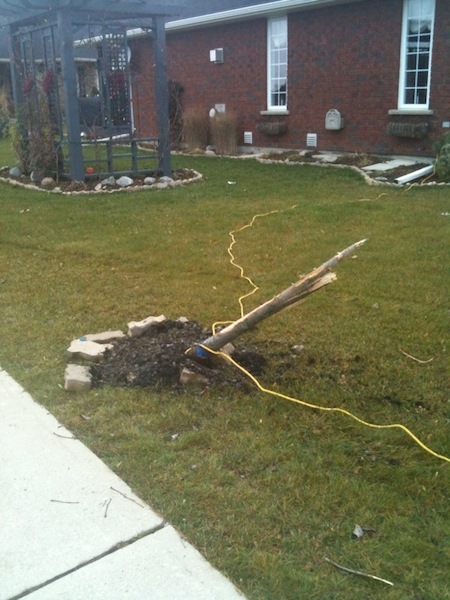 Total damages are in the neighbourhood of $50,000. A 48-year-old man has been charged with Impaired Driving, Dangerous Operation and Fail to Remain. Thank goodness no one was injured.